Upscale entertaining at home continues to be a welcome trend. We page through magazines for creative table decor inspiration, gather multi-course meal ideas and maybe choose a signature cocktail for the evening—which can tie it all together and make it even more festive. That’s wonderful for bigger events. But what about enjoying a cocktail on a weeknight with some take-out? Or turning a spur-of-the-moment gathering of neighbors into a casual happy hour? Too often our evening drinks default to wine or beer—both excellent options, but not nearly as fun as whipping up Monday night Manhattans or some random Rob Roys. Even with the resurgence of classic drinks—spurred in part by glamorous 1960s-era TV hits like “Mad Men”—cocktail culture still seems mostly confined to bars or restaurants. Why don’t more people enjoy cocktails at home? Maybe seeing a plethora of liquors and mixers and fancy bar tools when you are out on the town seems intimidating. 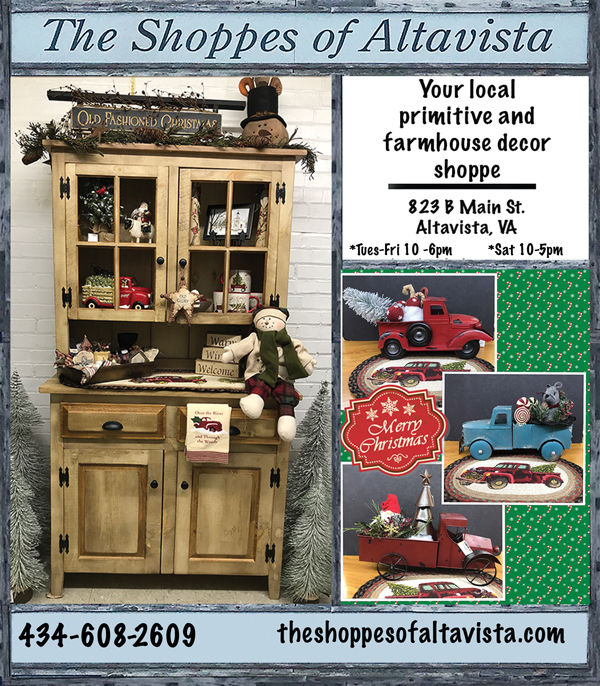 How could you ever afford, or even find, all those different bottles and shakers and thingamajigs? Or, even worse, what if you buy all of that and you just can’t shake and stir as well as your local bartender? 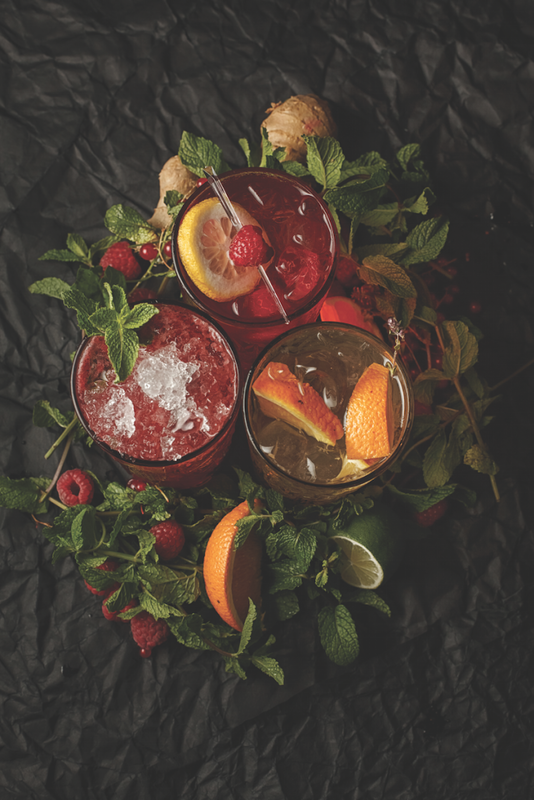 Time to unleash your inner mixologist. There’s no reason to wait for an evening out to enjoy a favorite fancy creation. 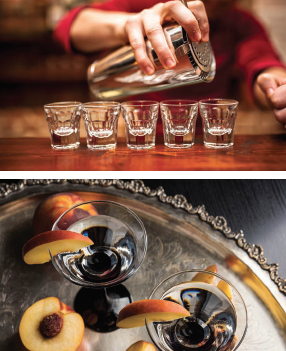 Buying some basic ingredients and equipment for a home bar can be fun, and becoming your own bartender is the best way to ensure you get the exact cocktail you want, just the way you want it. Restaurants and bars always have way more liquid options than are necessary for a basic home bar. They have to cater to thousands of people a week. You are catering to you, so just buy what you want. Having said that, all bars will have some basic alcohols that form the basis for many classic cocktails—which you should have on hand for yourself, but also for guests, and significant others, of course. For your home bar, you will want to invest in good quality “top shelf” brands, so that whatever you make at home will be the best of the best. 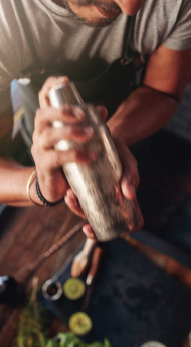 Now, if you have a favorite drink that you always order at a local bar, of course, make sure to buy that base alcohol for your new home bar—such as a true rye, 100 percent agave tequila, or specialty liqueurs such as Cointreau or Kahlua. You may also want to stock a few bottles of bubbly, such as a Spanish cava, Italian prosecco, French champagne or a nice California sparkling wine. Some classic cocktails call for champagne and any of those should do the trick. You will also need some basic additions, such as sweet and dry vermouth, Angostura bitters, and grenadine. 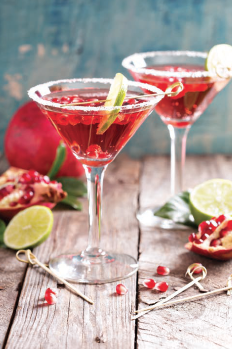 If you personally favor cocktails with other specific ingredients, buy those as well. While many of these will last a long time, for space issues you may want to buy smaller bottles, if possible. Other ingredients, like simple syrup and mixers, you can make much better on your own. Simple syrup, used to sweeten drinks, is just sugar water. To make it, measure equal parts water and sugar in a saucepan and heat on medium until dissolved. Chill and put in an empty bottle in the fridge. Another option is agave syrup. It has a somewhat neutral flavor and keeps at room temperature without crystallizing. You’ll also need cans or bottles of club soda, tonic water, ginger ale, orange juice and tomato juice. Some other flavorings may already be in your cabinet—like Tabasco, Worcestershire sauce and grated horseradish. In keeping with aiming for high quality cocktails, don’t buy packaged sour mix, Bloody Mary mix or other standard mixers. Instead make your own with lemon or lime juice and individual ingredients. They will taste better, have less artificial ingredients, and have fewer calories than store-bought, pre-made mixes. To that end, plan on having a bowl of fresh lemons, limes and oranges on hand. In addition to your basic citrus trifecta, you should have basic garnishes available, such as celery, plain pitted green olives (without the red pimento insert), cocktail onions, maraschino cherries, and fresh mint leaves (which also double as a main ingredient in some classic cocktails). Now for your equipment. You’ll need something to shake AND stir, for maximum mixology. Buy a good shaker, new. Secondhand shakers—especially vintage ones—look great, and you may want them just to make your bar area look swanky. But a firm seal is critical for mixing, and secondhand mixers are often banged up and not suitable for a heavy shake. Invest in a good new metal shaker, or a clear plastic shaker that has a tight rubber seal. Metal shakers are easier to care for, since you can usually put them in the dishwasher, but the plastic ones are often worth the hand washing because they are sometimes easier to manage, with their tight seal and the fact that you don’t chill your hands while shaking the drink—an unfortunate if humorous side-effect of the traditional metal shaker. You’ll need a true jigger with actual measures (i.e. keep that shot glass you bought on Spring break a decade ago in the cabinet). A strainer, muddler, a zester and a tall thin bar spoon should round out your collection. Next, make sure you have some basic glassware. You’ll need: traditional V-shaped martini glasses; rounded coupe glasses (which were used for sparkling wine before flute glasses became the norm); tall, thin highballs or coolers; and lower, squat old fashioneds. You probably already have some of these glasses—or close enough to those shapes that you can use them. Also, have at least one nice glass pitcher for a larger batch of any given cocktail, and an insulated ice bucket. Once you have your go-to basic bottles of booze and bar equipment, and have mastered the art of mixing up some classics, you may want to take it a step further and actually set up a bar area in your home. This can be a dedicated space in your kitchen, a rolling cart, or a small credenza you convert into a devoted mixing space. If you really want to make your home bar a showcase, upgrade your glasses and pitchers to either fancy modern purchases that match, or scout antique stores or thrift stores for vintage mid-century modern barware for some original flare. You certainly don’t need swizzle sticks, but if you find some fun ones that match your decor, buy them. Your guests will love the added touch. 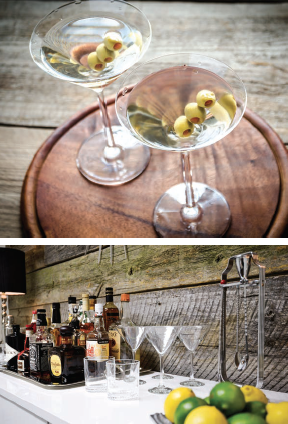 If you are looking to entertain with your new bar setup, another helpful item is an actual bar guide. Yes, you can look up every recipe you want on the Internet. But you don’t want to step away from your guests to check your smartphone for that ratio of gin to vermouth. Buy a nicely bound cocktail recipe book and have it handy. They often also contain the history of drinks and can be a nice conversation piece while your guests are waiting for their made-to-order concoctions. Or use it as a “menu” for guests to choose cocktails they’ve never tried before. 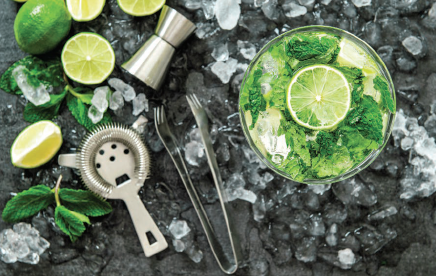 Whether you just want to treat yourself to a weeknight pre-dinner cocktail or impress your friends with your newly found mixology skills, all you need to build your home bar are some basic alcohols and ingredients, and a few bar tools and easy-to-find glassware. You’ll soon be on your way to perfecting the art of the cocktail in the comfort of your own home. No tipping required.